Dealer 4 is the newest, fourth generation card dealing machine (following Autodealer1, Autodealer2 and Autodealer3). It is the most sophisticated and modest bridge card dealing machine in the world. 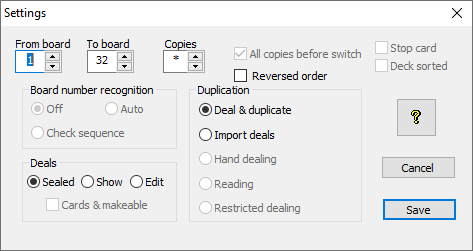 With the update to BOS-X [BOS package 10.13 and later] the DupSoft hand records display slightly differently. It is important to note that users who have not yet updated to the latest version of BOS should be doing so as soon as practical. If you need help please contact BridgeNZ. The purpose of this document is to allow the user to configure their system to be able to see all the information previously available without compromising the security of the deals. 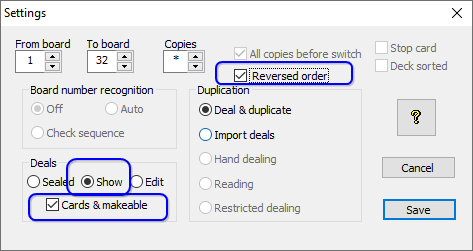 This will now show the deals on screen, but by choosing “Reverse Order” only the last deal in the set will show on screen, and if an extra board or two are generated (not necessarily dealt) then this will never be an issue. Note that only the last board shows on screen and the makeable status is there for you to see when it finishes. Next time you generate a set of deals, the last deal will show on screen but you will see the increase in the makeable contracts. This is a one-off change and you won’t need to do these changes every time you deal – just back to “Normal” but a new normal. Dealer 4 is constructed to provide long and reliable operation. Using stainless steel as main chassis material provides robust and good looking construction. Direct drive Brushless DC and Stepper motors, ball bearings and no belts or gears provide long life and low maintenance operation. The powerful 200MHz DSP processor provides fast and accurate functionality. Full control of card movement eliminates any possibility of error during dealing leading to an incorrect board. **errors during dealing are possible, read errors, feed card and gate errors can happen. They depend mainly on the condition of the cards. The acceptable error ratio for cards in good condition is 1 error for 100 dealt boards. These errors are reported and the machine operator can take proper action. 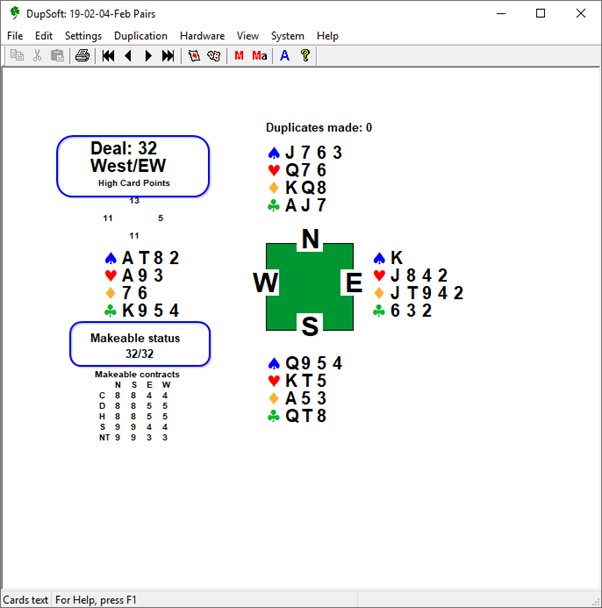 Probability of the undetected error which can lead to an incorrectly dealt board is zero. **regular maintenance of the machine is required. Do NOT use any solvent on the lens of the Dealer4/4+. BridgeNZ is the official sales and support centre for the Dealer4/4+ in New Zealand and can provide assistance or servicing as required. Please call to arrange a time before sending your Dealer4 for service, and please include the power supply and at least 2 decks of average wear cards for testing and calibration. User manuals and software updates are available for free download from the Dealer4 support site. Contact: Please contact BridgeNZ by email or phone 027 404 4648 for any sales or service enquiries. BridgeNZ usually only require the machine for one full day. Ship in the original box supplied, as this is specifically designed for this purpose. Include 2 decks of cards of average wear (not new) for BridgeNZ to test the machine after servicing. These will be returned with the machine. A contact person should be available with authority to approve any cost in addition to the service charge. BridgeNZ usually contact the person to get final approval before proceeding with replacement of parts. EasyDealer is software that generates hands and saves appropriate files for dealing and posting to the web. The default install is fully functional but to have your club name on documents and customise session names and times requires the purchase of a licence for $120.